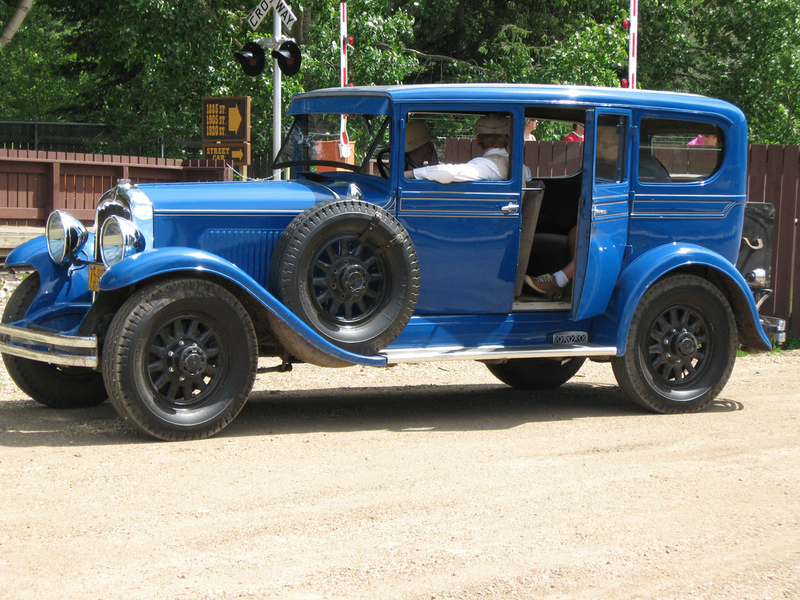 In my last two posts, I enthused about Fort Edmonton Park’s motorcars, and then explained (more or less) how to go about driving a Ford Model A from 1928. Now, let’s talk about why it’s so important to have these cars available at a living history museum. Aside from just the “being really, really cool” factor, what are the main advantages of having functioning artifact vehicles on 1920s street? Why are interpreters and historical workers so keen on keeping them up and running? Wouldn’t it be safer to just have them sit every day as museum pieces behind ropes with “tombstone” placards with the model name, the years they were produced, their top speed, and their original price? Advantage #1: Driving cars populates a street that visually looks very empty. 1920s street is the biggest and yet least developed street at Fort Edmonton. The park began with the fort, which was built with the help of the money and interest in Canadian history coming out of the 1967 centennial of Canadian confederation. The park was further developed with 1885 street in the 1970s and 1980s, and 1905 street in the 1980s and 1990s. Until the last decade or two, there was very little on 1920s street, aside from Mellon farm, which is the only structure that still stands on its original land in the park (though it was moved from its original foundations which were nearer to the train station entrance). In the past decade, 1920s street has acquired a Midway, and just got a new movie theatre (which I am pleased to see is now showing films from the 1920s (silent films and talkies) and more modern “historical” movies in addition to the “Northern Lights” video about the park). However, the landscape of the street is dominated by a very large farm, with most of its buildings clustered at the far end of the street away from the train station and entrance. It’s also the street with the fewest interpreters and volunteers in the largest space, at least compared to the concentration of the fort or the large number of buildings on 1885 street. Last year on 1920s street we had four interpreters, one historical worker (George, the mechanic), a handful of Midway staff to run the theatre and the Tom Thumb golf course (the rest being segregated on the Midway), and about six or seven volunteers who came in once a week or so. Less than ten people, spread across several hundred metres, were meant to represent a city whose population was in the tens of thousands; on many days, there could be only two or three people in costume on the street for hours at a time. Having cars driving down the street does a lot to liven the place up, making it look more populated. I do recall a proud moment last year where the streetcar, myself in one of the cars, one of the maintenance guys in one of their historical trucks, and one of the other interpreters coming from the other direction, all stopped at the railroad crossing as the train went by. I overheard a small child shout out: “Look mum, it’s a traffic jam!” That’s a rarity, but an ideal to strive for; we don’t want Edmonton looking like a ghost town, particularly when it’s meant to be a bustling metropolis… and it is the first impression visitors have of the park when they walk in through the front gates. That’s one of the reasons I liked to take the cars for a spin down to the train station to honk and wave. If a person in costume driving a cool historical vehicle is the first thing one sees when one enters the park, the visitor is instantly reassured that their day is going to be an awesome one. The 1929 REO, parked near the train station at Fort Edmonton Park. It has lovely comfortable seats, an electric starter, electric headlights (not acetylene, like some of the earlier models), and even an electric windshield wiper (unlike the one on the Ford Model A, which must be moved by hand). A classy vehicle. Note, too, the luggage rack on the back. Advantage #2: It gives (female) interpreters a chance to speak about some little known aspects of Edmonton’s past: women drivers. One of the comments I got a lot was surprise at the fact that a women was driving. People often think in terms of dichotomies with the past: as we are modern and enlightened in the 21st century, so it must be that in the past we were not. Women didn’t have the right to vote, then they got the right to vote. People have the impression that women didn’t drive in the 1950s, but do now, so of course they wouldn’t have driven in the 1920s. Simple ideas of historical progression precludes the notion. People are uncomfortable with “regressions”, or challenges to the narrative that places us in the present day as the enlightened ones who corrected the mistakes of the past. For instance, many are shocked to learn that in some areas of North America, women, particularly widows who owned land, had the right to vote for generations until it was explicitly taken away from them. Women in what is now Quebec had the right to vote in specific circumstances until 1847 and then lost it until 1940. Women had the right to vote in many of the British colonies (particularly those dominated by religious groups who believed in rough equality of the sexes, like the Quakers) until the American Revolution when the new legislation enacted by the Republic explicitly took those rights and privileges away. The same holds true of free black men in many areas who voted in many elections until the American Revolution. Unfortunately, we as human beings are not necessarily becoming ever more enlightened, as assumed by so many, so I believe it is important to challenge these assumptions and our self-congratulatory attitudes as citizens of the modern world. So it should be with women drivers. Thinking in simple dichotomies of “women in corsets being oppressed by men and having no say in the world” versus “modern women entering the workplace and being able to vote and wear pants” ignores the strength and agency of the women who lived prior to the Women’s Liberation movement of the 1960s or the women’s suffrage movements which culminated in the 1910s and 1920s. Long story short: it wasn’t just men blazing trails in the early decades of the automotive industry. These stories should be told and represented. Now, women were never a majority of drivers, but they were often more common than many would think. Alexander Rutherford, the first Premier of Alberta, never learned to drive, for example; his daughter, until his death in the 1940s, was also his chauffeur. Once cars became easier to start and thus less strenuous to use, it became more socially acceptable for women to drive. The main barrier for a while was the cost of cars, and as fewer women worked outside of the home for wages, that was a big consideration with regards to car ownership and maintenance. Some early female car mechanics also had to challenge the notion that they couldn’t use tools designed for bigger male hands. However, even if their husbands owned cars, that did not mean that those vehicles weren’t driven by women: why drive to work and park it outside all day (like we often do today) when your wife could use it all day to call upon people and do errands… and be seen about town in an expensive car? In some areas in the first decade of the twentieth century, driving motorcars was even considered a feminine pursuit. The history of female drivers is a fascinating one. See the reading list at the bottom of the page or speak to interpreters on 1920s street at Fort Edmonton for more information on the subject – and anecdotes! 3) Then there’s the whole social history of automobiles itself that can be better explained and demonstrated with moving vehicles. Beyond the technical considerations of operating early motorcars (seen in Part I of this post), there is also the social history of automobiles. As I’ve shown in a previous post on Edwardian Street Life (with videos taken from streetcar lines in 1908! ), people interacted with cars and other vehicles on the street very differently in the past. Until the 1920s and 1930s, people understood the street as a place to be in very different ways. It was a living space, dominated by pedestrians – also known as people going about their day – and everything on the road moved at the same pace, more or less, be they walking, in horse-drawn carriages, cycling, or even in cars (speed limits were very low at first in inner cities). People had to be taught that jaywalking was a thing, a dangerous thing, and a social faux-pas as well as a crime. (It used to just mean a country rube who was so unused to how cities bustled about that he wasn’t watching where he was going.) People had to be taught that roads were places for cars, not people. It was an important and revolutionary shift in thinking. Now, we can’t fully demonstrate at Fort Edmonton Park this dramatic change in how cities and roads were understood and used without endangering people, but we can make clear the idea that having a landscape dominated by motorized vehicles was not a given. The cars at the park share space with hundreds of pedestrians, in addition to the streetcars, cyclists, horses, and horse-drawn carriages. As previously stated I like challenging the idea of progress and the inevitability of modernity; for a while, there were many people who actively resisted the introduction of automobiles to cities, thinking that the change in lifestyle but more importantly the loss of life was not worth the convenience of travel for the rich few who could afford automobiles. Try to imagine a world in which automobiles were banned as dangerous and reckless weapons. How would our cities – and our country – have developed differently? Interpreting with artifacts isn’t just about barraging visitors with facts about the original prices, top speeds, and manufacturing information of various models of vehicles. While interesting, and definitely important and of interest to visitors, it’s nothing that they can’t look up using our trusty friend Google or find out from any other museum with motorcars in their collection. Why is it so important that these artifacts are driven? To me, it’s about the social history of cars: the material experience and reality of being a driver in an earlier time period, not facts and figures about technological changes. Visitors can investigate the cars in far closer proximity than most museums would allow (provided, hopefully, that a costumed interpreter or other employee is monitoring them), and seeing them move in person is very different than even seeing historical footage. As an observer, you can see, hear, and even feel how different these vehicles move. You may have to do some emergency repairs, just like an earlier generation of motorists would have done. Visitors can feel the heat of the engine and the rumble as the car moves, and can hear the raspy bleating sound of the horn. The visitor’s sensory experience isn’t just limited to sight, making what they learn all the more memorable. The sheer materiality of artifacts that can be understood through multiple senses should not be underestimated. Everything can be turned into a learning experience for the visitor. It was in fact a part of my interpretive style. I didn’t want to just lie in wait for visitors to come into my line of sight and then pounce upon them verbally with historical facts (though that did happen on occasion). Instead, I liked to be doing activities – going about my day normally – and have visitors come across me. I felt more authentic; I was a real person, not a mannequin waiting to be animated by the presence of visitors. Driving – doing errands – was a huge part of that. I could be on my way to the drug store from the train station, ready to pick up some prescription (anti-asthma cigarettes, perhaps? ), and deliver them to a friend at Mellon Farm. I could easily pull over and speak to visitors who were interested, and then I had at least two or three ready made conversation starters: what are you doing? What are you driving? Why are you driving that car? Where are you going? (Can I come with you?) The motorcar wasn’t just a way to access stories about the technological history of automobiles: it was a bridge to many different stories from Edmonton’s past. Disclaimer: As previously mentioned in the disclaimers of my previous post on blacksmithing at Fort Edmonton and Fort Langley, I am not a current employee of the park. I am speaking purely from my (awesome) experience as a past employee. Policies may have changed. Perhaps the vehicles are now merely decorative, or are reserved for special occasions. But I hope not. Nevertheless, please do not sidle up to interpreters and demand rides in the historical cars. Getting a ride in the historical vehicles is not a right, but a privilege, dependent on a multitude of important factors, including safety regulations (i.e., weather conditions, crowds, if the car is in need of minor repairs), interpreter availability and training, whether or not the interpreter has other responsibilities (sadly, interpreters and volunteers are not paid or expected to spend the entire day behind the wheel but have other duties and responsibilities), current park policy, number of visitors requesting rides, and whether or not the interpreter is comfortable with bringing that particular individual into the vehicle with them. “Don’t get in a car with strangers” applies to interpreters inviting you into their vehicle too. If you are too distracting, which would make it difficult to concentrate on driving, or make the interpreter uncomfortable, they reserve the right to not get into a potentially dangerous situation for either person involved. (That also means that if you made an inappropriate sexist or sexual comment about me and women’s roles in society vis à vis their ability or right to drive cars (“Hey beautiful, move on over and let me drive!”), now you know why I looked really unimpressed and made excuses to get out of there and park the car in the garage out of sight.) In short: admire and discuss the cars and see what happens next. Pick the brains of costumed interpreters, historical workers, and volunteers at Fort Edmonton Park hanging around the Motordrome on 1920s Street. If you are in the Edmonton/Calgary area and have a motorcar of your own that is capable of driving along the highway, I would definitely recommend visiting the Reynolds-Alberta Museum in Wetaskiwin. They have an amazing collection of old vehicles, from early home made snowmobiles, luxury cars from the 1920s, gigantic tractors, and everything in between. The Reynolds-Alberta Museum also put out several small books on the subject of early automobile travel, specifically in Alberta, which are fascinating reads full of local photographs and anecdotes: Kelly Buziak’s Taking to the Road: Early Auto Touring and Camping in Alberta and Sean Moir’s Perilous Journeys: Early Motoring in Alberta. “The Modern Moloch“: a 99% Invisible Podcast episode on the definition of jaywalking and early reactions and resistance to the dangerous mechanical contraptions that were taking over living space in cities. It will change how you think about cars and pedestrians and how the distinction came to be. As a cyclist, I find this article an interesting “what could have been” case study: Meet the one city in America where cars have been banned since 1898. AMA Vintage Vehicle Weekend Flickr set by Fort Edmonton Park. Off to the Archives in Edmonton, Calgary, and Banff I go! I had exactly this experience just a couple of weeks ago. I was talking to an interpreter at an “auto-camping” display on 1905 street on Dominion Day, and I was surprised to find that she was a motorist. I’m embarrassed to say that I just assumed that women didn’t drive much 100 years ago, or if they did, they would use an easier “girl’s car”, like the Firkin’s electric (Jay Leno implied as much in a video about his 1909 Baker electric, but maybe I should take what a comedian says with a grain of salt). Even though I’ve been to Fort Edmonton Park many, many times, I still learn half a dozen new things every time I go. It’s an assumption that too many of us make! I won’t hold it against you. I was only peripherally aware of female motorists until I started to work at the fort. There have been issues before with female interpreters, say, wanting to learn to blacksmith, and being shut down because it wasn’t historically accurate, but we’ve always had strong female interpreters insisting that they had the right to drive, with the historical research to back it up. I love the history of female motorists – it’s much richer than many think!